- Take a your flight to Saigon. Welcome by our local tour guide & then transfer to hotel for check in. After that, take a short time visit Notre Dame Cathedral (built in 1877), General Post Office, War Crime Museum, China town. - In the evening, Enjoy your dinner on Cruise driving around Saigon river. Contemplate sparkling Saigon at night & join eventful music show on cruise. Overnight in Saigon. 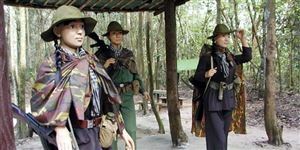 - Morning breakfast, and transfer to Cu Chi Tunnels which stretched for over 200km by Viet Cong, became legendary during the U.S -Vietnam War in the 1960s. Have lunch at local restaurant. - Afternoon, followed by a transfer to Vung Tau beach city. It takes about 2 hours for driving from Ho Chi Minh City. 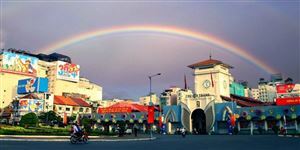 Vung Tau is ideal for tourists to participate in water activities, especially for beach-lovers. - Upon arrival, visit Thien Hau Temple of Five Races, the Whale temple. Have dinner at local restaurant. - Overnight in Vung Tau. - After breakfast, visit the Summer Palace of Emperor Bao Dai, the Jesus Monument, which overlooks the peninsula and the Pacific Ocean. 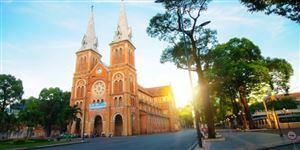 Next, visit Whale Temple Christ Hill, Goddes of Mercy, and Thuy Van Beach. - Have lunch at local restaurant. Afternoon, drive back to Ho Chi Minh city. Free time for shopping & have dinner at local restaurant. - Overnight in Saigon. - Breakfast at hotel, then transfer to My Tho. The morning trip continues on the motorized boat on the Tien River to visit four holy islets: Tortoise, Dragon, Phoenix and Unicorn. - On the way, you will see the fishing port, stilt houses, boat-building workshops. The cruise will lead you through Bao Dinh Canal to enter Ben Tre Province - "the country of coconut" to see a typical agricultural model call "Garden - Pond – Cage” then enjoy coconut candy mill and the relaxing honey tea. Then take an amazing rowing boat trip on the small canal - fully covered by the shadow of the water coconut’s tree and cool breezes. Lunch will be served in the heart of the orchard garden, where you will enjoy countryside delicacies. - After lunch, we will walk into the village, visit fruit gardens, enjoy the tropical fruits while listening "Southern Vietnamese folk music". Here we also can join the daily activities of the local people and enjoy the atmosphere of this beautiful natural countryside. Your expectations will be fulfilled by final boat trip back to My Tho on the Tan Thach natural canal. - On the way back to Ho Chi Minh City, you will stop at a Bonsai garden where you can take a rest for 15 minutes. - Dinner & overnight in Saigon. - Breakfast at hotel. Free until the coach pick you up to Tan Son Nhat airport for your flight back to Singapore/ Kuala Lumpur. End of the trip. - Accommodation: 05 nites at 3* Hotel with twin/double sharing & daily buffet breakfast. - Full board with Vietnamese/Chinese foods (or Halal foods if required). 01 dinner on Saigon river cruise. - The package price are not applied for period of Vietnam National Holidays including: Lunar New Year, Reunification & Labour day (28th April to 03rd May), Hung King Death Anniversary (16th April), Independence Day (02nd Sept), New Year 2017 (31st Dec to 2nd Jan). Compulsory meal on Christmas Eve has not included yet (24/12).